Here it is. CWB’s third annual list of the most robbery-filled blocks in Wrigleyville and Boystown. Muggings were down 34% in the neighborhood last year, due in large part to strategic patrols by 19th district officers. But a local police zone that covers the center of Wrigleyville and Boystown—beat 1924—still managed to rank #3 citywide for robberies last year. To no reasonable person’s surprise, the intersection of Belmont and Sheffield is easily the most dangerous area in our neighborhood, with 25 robberies reported there last year. That’s down from 36 robberies in 2013. Also notable this year is that only one of the robbery hot spots lies east of Halsted Street. It's on Belmont, of course.. 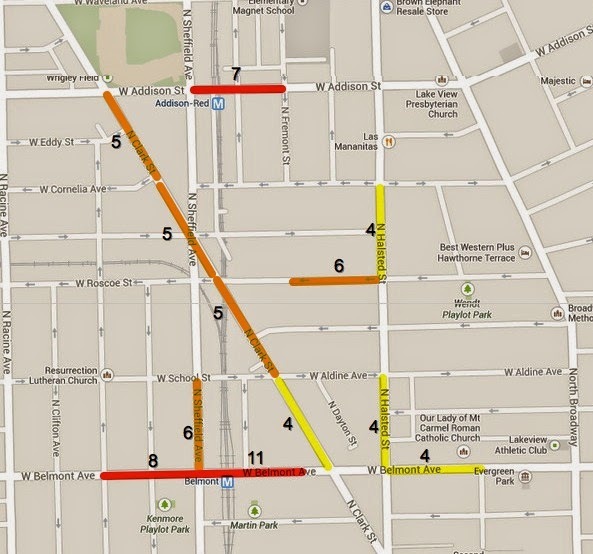 In 2013, six of the most dangerous blocks were east of Halsted. See 2013’s most dangerous HERE and 2012’s HERE.